We acknowledge that your life experiences deserve to be recognized, therefore there are no courses required to obtain any of these degrees. 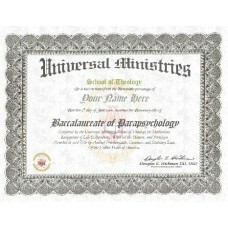 The Universal Ministries will award you with any honorary degree(s) offered by us that you deserve within our guidelines. 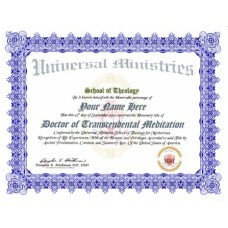 All our degrees are legal Certifications. 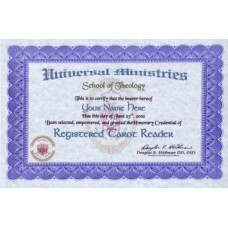 Each and every one of our Certifications carry the full authority of the Universal Ministries School of Theology Honorariums Committees. 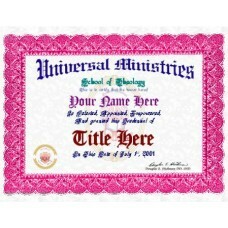 Please keep in mind that these Specialized Title Certificates are NOT educational degrees. 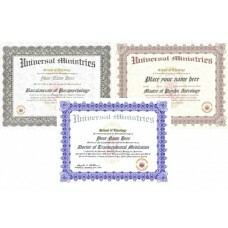 We would also like to point out that it is to your benefit to become an ordained minister (in whatever faith or belief you follow) with the Universal Ministries. It is open to all who ask. 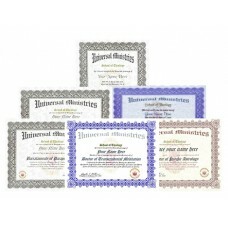 Universal Ministries offers a variety of specialized religious titles. You can now receive a certifi.. Registration within a field shows proof of a general practitioner working at their vocation. 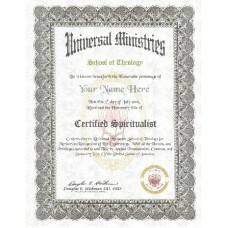 Proudly..
Certification within a vocation shows proof that the practitioner has developed competency within th..
A student may study to reach the level of bachelor of a more specific interest. At this point many a..
At last, the few students capable of achieving the highest of all credentials receive the Doctorate(..
Once students continue beyond the Bachelors degree, they may go into postgraduate studies of a speci.. 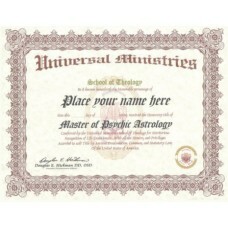 This Complete Display Package includes the Bachelor, Master and Doctorate Degree of your field of ex.. 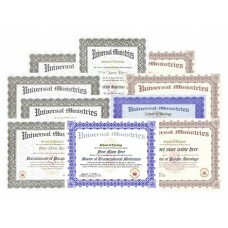 This Complete Display Package includes Everything in the Basic Package PLUS an associated Bachelor D..
Everything in the Deluxe Package PLUS 2 associated Bachelor Degrees and an associated Master Degree,..